This is a lovely paste. My sister who lives in Belgium gave it to me. Flavor: clove... what a pleasant contrast with the minty pastes we get here in the States! The color is a chalky green with a slight brownish tinge to it. No artificial anything. It does actually leave my mouth feeling fresh and clean. 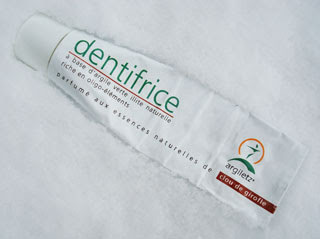 The main name, "dentifrice" means simply "toothpaste". In North America, you can buy some of their pastes here. But they don't sell clove. And you'll have to pay $15 for a tube! In France? Probably just go to your local pharmacie (and pay a lot less). 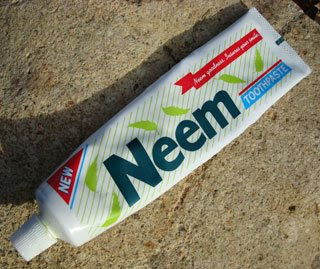 Neem Toothpaste is made in Calcutta, India. 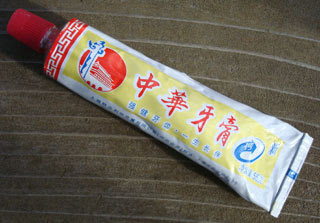 It has an herbal flavor that you won't find in any mainstream paste. Neem is an herb that has purported curing properties beyond what any western doctor (or dentist) would ever tout. This one is strange in that it turned to solid between the time I used it last (about four years ago) and now. So now it's unusable. Sigh.